Another year and the end of January can only mean one thing, Global Games Jam 2016 and the blog post about what I worked on. My fifth Games Jam now took me back to Staffordshire University, for the final time at the Stafford Campus before their move to Stoke on Trent. Based on this year’s theme "Ritual" our team of 3 began work on a PC game called Demon Duel. “Demon duel is a two player demon battling game! Each player populates their pentagram from a collection of artefacts to summon the ideal fighting demon! Choose from items such as the tail of an ox and the feather of an eagle to get the best traits of speed, strength, defence, and stealth. Learn the points of your pentagram to best position those traits then it's time to fight!" 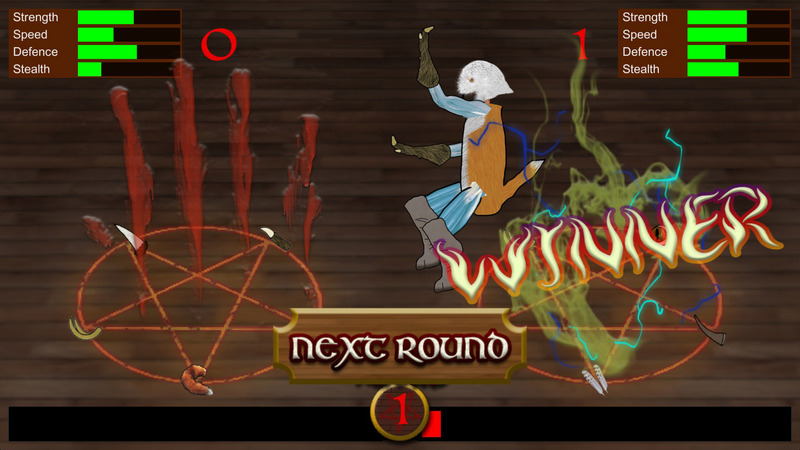 The image below is the main fight screen for the game where the summoned demon has won the fight.